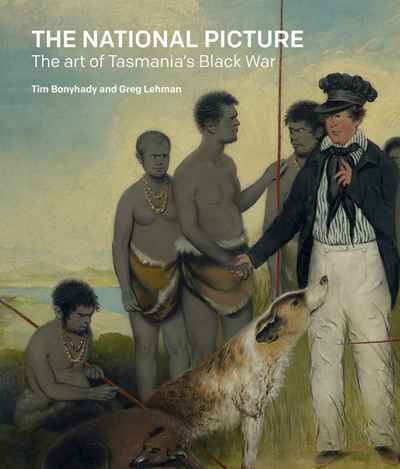 ‘Benjamin Duterrau and his National picture project are at the core of this publication because he was the colonial artist most interested in Tasmania’s Aboriginal people, and the only artist who chose to depict, on a substantial scale, their conciliation or pacification by George Augustus Robinson’, writes Tim Bonyhady and Greg Lehman in their introduction to The National Picture: The Art of Tasmania’s Black War. The fresh research presented by Bonyhady and Lehman in this insightful new book from the National Gallery of Australia will no doubt tantalise art lovers and historians alike. It will also appeal to anyone interested in Australia’s colonial past and in the ongoing interrogation of the historical record by Aboriginal artists and activists. Bonyhady and Lehman’s introduction continues: ‘For Tasmanian Aboriginal people today, Duterrau’s paintings provide a tantalising and rare visual record of the unique culture practice of their ancestors. Robinson’s journals offer written descriptions of activities, such as spear-making and throwing, kangaroo hunting and ceremonial dance, accompanied by only a scattering of small, often crude sketches, which are vitally important firsthand observations’. This publication serves to conjure up and interrogate Tasmania’s colonial past. Colonial representations of Tasmanian Aboriginal people are among the most remarkable and contentious expressions of Australian colonial art. The National Picture sheds new light on the under-examined figures in this difficult narrative: colonial artist Benjamin Duterrau, the controversial George Augustus Robinson and the Tasmanian Aboriginal people upon whose land the British settled.